Unlock the more straightforward side of Harry Potter and the Chamber of Secrets with this concise and insightful summary and analysis! 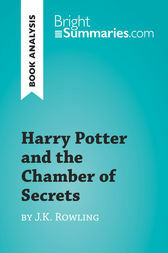 This engaging summary presents an analysis of Harry Potter and the Chamber of Secrets by J.K. Rowling, which follows the Boy Who Lived during his second year at Hogwarts School of Witchcraft and Wizardry. Harry is looking forward to returning to school, but he is warned by a house-elf called Dobby that he will face grave danger when he arrives. Sure enough, the students are soon beset by a series of mysterious attacks carried out by the heir of Slytherin. It is up to Harry to delve into the past in order to discover the heir’s identity, find the Chamber of Secrets and defeat the monster that lurks within it. Harry Potter and the Chamber of Secrets is the second novel in J.K. Rowling’s bestselling seven-book series, which has inspired films, video games, board games and even a theme park. Rowling is now a household name around the world, and her other books include The Casual Vacancy (2012) and The Cuckoo’s Calling (2013), which was published under the pseudonym Robert Galbraith. Find out everything you need to know about Harry Potter and the Chamber of Secrets in a fraction of the time!